The CL-S300 offers direct thermal printing in a compact and ultra-simple-to-use printer. With no external power supply, the CL-S300 is designed with desktop efficiency in mind! This, along with the easy WINDOWS GDI (Graphical Device Interface) utilizing a USB connection, makes labeling even simpler and more cost effective. 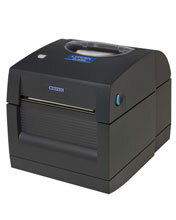 Direct thermal printing, 203 dpi, 4.25" print width, USB Interfaces, and US Power cord. Cables sold separately.